It’s a salient fact that London’s most famous buildings are either Restoration or Regency paeans to classic design, bridges or former power stations. A short jog down the river from a mix of all three of these, and housed in one of the latter, is the OXO Tower Restaurant, Bar and Brasserie. The outside seating, with its views of the Thames and St Paul’s, were no doubt packed this past summer, as all and sundry thronged to areas where they could make the most of the spectacular summer weather. Looking after them all was an eight-strong team of sommeliers, led by Diego Muntoni. Muntoni’s time at the OXO Tower stretches back to 2003, when he spent five years there as head bartender. 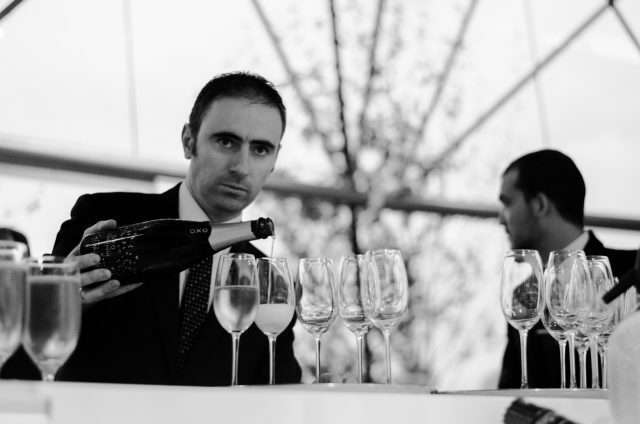 After a break, he returned in 2010 as the assistant head sommelier, until 2012 when he assumed the mantle outright. As so often with the drinks industry, Muntone’s entry into it was not exactly planned. A young Italian who moved to London in 1998, in 2000 he was a bartender in a restaurant in Covent Garden, and pretty much the only non-Frenchman in the team. Desperate to prove himself, before long he was recommending wines to customers. Working through a variety of restaurants, from Spanish to Asian fusion, he eventually ended up in the tower by the Thames, and before too long had pretty much memorised all 700 bins by heart. On his return he was determined to make a success of being a sommelier, and within a year had blitzed through the WSET Intermediate and Advanced courses (achieving top grades in both). Drawing on the resources of the OXO Tower’s owner, Harvey Nichols, Muntone has wines for every palate and occasion, helped along by a rotating selection of between 40 and 60 wines that are accessed via Coravin. This has, at time of writing, included some very interesting white Nuits-Saint-Georges Blanc, and the guests’ favourite, Châteauneuf-du-Pape, Charbonnière.